(Български) Мониторинг на СП “ПХРАО – Нови хан” 2017г. (Български) Мониторинг на СП “ПХРАО – Нови хан” 2016г. (Български) Мониторинг на СП “ПХРАО – Нови хан” 2015г. (Български) Мониторинг на СП “ПХРАО – Нови хан” 2013г. (Български) Мониторинг на СП “ПХРАО – Нови хан” 2012г. SD NRRAW was officially registered as a SE RAW division on November 1, 2012. The division’s scope of work is related to the construction, commissioning and operation of a repository for long-term storage of low- and intermediate-level radioactive waste. In order to fully complete the RAW management cycle, the waste has to be buried forever in a permanent repository, which shall guarantee the lasting and reliable insulation of the processed and conditioned RAW from the people and the environment. As a result of governmental decision of 2005, purposive actions were undertaken for realization of this complex process, which shall be completed with the commissioning of SD NRRAW at the end of 2015. In the time line, this process is divided into three major stages: site selection, design and construction. After the performance of regional and detailed geological and geophysical, geochemical, engineering and geological and hydrogeological surveys, a site for construction of the national repository was selected – ‘Radiana’ site. According to the requirements of the Bulgarian legislation and the International agreements, the SD NRRAW project should have received the approval of the population of the place where it will be realized. The investment proposal of the Enterprise for ‘Construction of a National repository for short-lived low- and intermediate-level radioactive waste’ was presented in details during three public discussions held in 2011 – on March 29 in Kozloduy, on March 30 in Harlets and on July 7 in Beket, Romania. By a decision of the Council of Ministers the repository, which will be built on ‘Radiana’ site, received a status of a site of national importance and of a national construction project. On 23 December 2016, the Ministry of Environment and Waters (MEW) issued a Decision regarding Environmental Impact Assessment (EIA) No. 7-7/2016 approving the implementation of Investment Proposal Construction of National Disposal Facility for Low- and Intermediate Level Radioactive waste – using the technology for the disposal of Low- and Intermediate level radioactive waste (RAW) into a near surface multibarrier trench type repository with the State Enterprise Radioactive Waste as Employer. On 5 May 2017, the Chairman of the Bulgarian Nuclear Regulatory Agency issued aNDF Construction Permit . On 9 June 2017, State Gazette promulgated the Construction permit for the National Disposal Facility for radioactive waste on Radiana Site issued by the Ministry of Regional Development and Public Works in favour of SERAW (Construction Permit No. РС-21/25.05.2017). The Construction Permit came into force on 26 June 2017. On 29 August 2017, SERAW officially started the construction of a National Disposal Facility for Low- and Intermediate Level Radioactive Waste (NDF). At an official ceremony at the Radiana Site, the Minister of Energy Mrs. Temenuzhka Petkova and the Executive Director of SERAW, Mr. Dilyan Petrov, made a symbolic groundbreaking of the future NDF. The repository is designed to receive treated radioactive waste which has been made safe and generated only on the territory of Bulgaria. It will receive Low- and Intermediate- level Radioactive Waste from the industry and medicine; waste generated from the decommissioning of Kozloduy NPP’s Units 1-4, as well as from operation of new nuclear power facilities. The NDF will not be used for disposal of high level radioactive waste and spent nuclear fuel. The site of the future repository is located in close proximity to Kozloduy NPP, in the two-kilometer protected area of the nuclear plant, on the territory of the village of Harlets, Kozloduy Municipality. The NDF is a facility with a multi-barrier protection for long-term storage of radioactive waste which was previously made safe and conditioned into reinforced concrete containers. The technologies and materials used for the NDF construction will be in accordance with all environmental, health and civil safety requirements. The repository will be a near-surface trench type facility of capacity 19 000 reinforced concrete containers of radioactive ware. 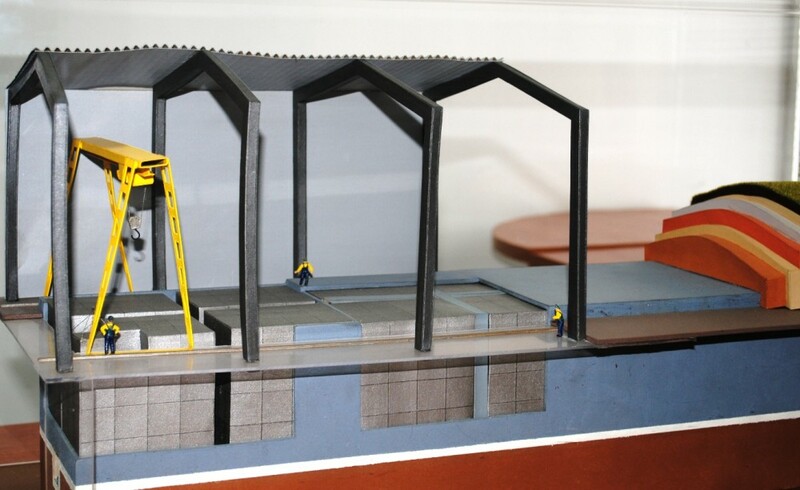 It will consist of 66 reinforced concrete structures (cells) distributed in three disposal platforms. The cells are separated by internal partition walls into chambers. After filling with packages, the cells are covered with reinforced concrete slab and insulated against the atmospheric water by constructing a multilayered earth embankment cover. The repository is planned to be operational, i.e. to be gradually filled up over a period of 60 years. It is then supposed to be closed. Throughout its operational life and for the next 300 years, the facility will be subject to continuous control by the authorities. The National Disposal Facility will be one of the most modern facilities in Europe of this type. The project is funded through a Grant Agreement by the Kozloduy International Decommissioning Support Fund, administered by the European Bank for Reconstruction and Development and the value of project’s first phase is EUR 71 820 000. The construction of the National Disposal Facility for Low- and Intermediate Level Radioactive Waste (NDF) is set out in the updated National Strategy for Management of Spent Fuel and Radioactive Waste by 2030 and is a commitment of the Bulgarian Government to the European Commission. Non-Technical Summary to EIA Report for NDF.